The Flintshire Observer of 1 October 1914 included a long article by Mr W G C Gladstone MP and HM Lieutenant for Flintshire, writing from the Barracks, Wrexham, appealing for articles of comfort for the soldiers at the front, especially for the benefit of those men who came from North Wales. The articles urgently required, those that would be very much appreciated, and those that should not be sent were listed. Mrs Delme Radcliffe (whose husband, Colonel H Delme Radcliffe, commanded the 2nd Battalion, Royal Welch Fusiliers) had kindly consented to receive, at Silsoe, Ampthill, Bedfordshire, and forward all suitable articles for the 2nd Battalion, already at the front, and Mrs Cadogan, Gayhurst, Newport Pagnell, would do so for the 1st Battalion, which presumably would soon be at the front. An article in Y Brython of 22 October 1914 by Yale Lloyd gives an interesting and detailed insight into one Sunday spent at the YMCA tent, the work of the YMCA for the troops, and the activities of the soldiers during that day. In the evening, Yale records, ‘The men release their pent up emotions by singing Stand up, stand up, for Jesus with the utmost fervour. 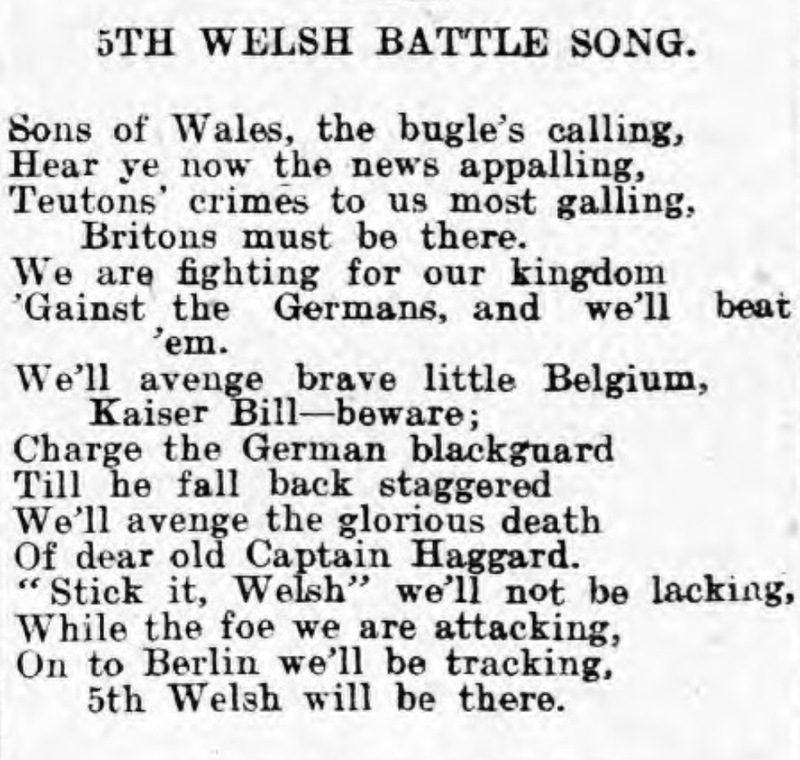 They are now in the hwyl (as no other language can express that state of enthusiasm like the Welsh) and more hymns are sung.’ Whilst Welsh troops are not specifically mentioned in the article, there were Welsh soldiers in the Bedford area at that time from the 1/2nd Welsh Brigade, Royal Field Artillery (Territorial Force). Military authorities at Bedford yesterday issued an order closing all licensed houses in the town for the sale of intoxicants today after 2.30 pm, reported the Cambrian Daily Leader of 31 December 1914. The order applied also to New Year’s Day. The Herald of Wales of 13 February 1915 reported that Ammanford was well represented in the YMCA tents. Mr W E Nicholas and Mr J H Norman Carr had recently left for Bedford and Mr D J Gregory would follow them in a week. The Llandovery boys with the 4th Welsh at Bedford have recently been presented with articles of clothing by the Llandovery Church House working party, the Herald of Wales reported on 5 June 1915. The Bedfordshire Times and Independent of 18 June 1915 also reported on some of the facilities provided in the town for recreation. ‘The Recreation Huts which the War Office built in Bedford when the Highland Division were here are now being run, under the Bedford Borough Recreation Committee, by the YMCA, and the canteen profits go to carry on the YMCA’s excellent work among the troops. The Recreation Committee supply the entertainments, and arrange the noble army of voluntary lady helpers, who have done so splendidly in Bedford since the war broke out. When the Scotsmen were here two of the huts were run by the Scottish Guild and one only by the YMCA, but now the YMCA run them all. ‘At the YMCA hut at the corner of Hurst Grove and Bromham-road, everything is going on as usual for the entertainment of the soldiers billeted in that locality. Though the weather does not encourage men to spend the evenings indoors, a keen interest is taken in the impromptu boxing tournaments held every Wednesday evening. Three two-minute rounds are allowed for each bout, and many avail themselves of the opportunity of becoming proficient in the noble art. There is also a billiard table provided which is at the disposal of khaki billiard players. ‘The Bedford Park Recreation Hall is under the supervision of the Rev F Coram, recently Congregational Minister at Birmingham. Mr Coram left the ministry for the time being in order to take up this work, and is most enthusiastic as to the possibilities in his new sphere. The interior of the Hall has been brightened up by numerous streamers of flags of all the Allied nations, with the exception of Italy, and Mr Coram would welcome the gift of a few small Italian flags, so that the latest of our Allies should be represented. A bagatelle table would also be most welcome. Though the troops are billeted some distance from the hall, it is well attended, especially by the 1/4th Welsh, and there are sing-songs most evenings. ‘Looking in on the Bunyan Meeting canteen on Wednesday evening, we found the tables crowded with soldiers, who were quietly playing games, reading the papers, writing letters, taking refreshments, and enjoying the charming songs the ladies were singing on the platform. The tables were garnished with flowers, and the scene was one of cheerful association. Several ladies were waiting upon their guests with light refreshments, or conversing with them. The soldiers evidently belong to a very respectable class, and showed every appreciation of the homely comfort and refinement of the Bunyan Canteen. ‘The Sergeants’ Mess of the 1/7th Cheshire Regiment is pleasantly situated in Russell Park. Near the entrance the title and badge of the Regiment are set out on a large cement tablet, which is quite a work of art. 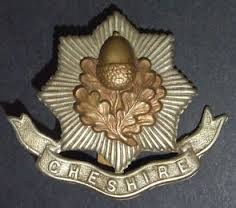 Within the Star of India appear the acorn and oak leaves, which form the regimental badge, and around it is the intimation that it is the Sergeants’ Mess of the 1/7th Cheshires, the lettering and device being worked in small white stones. Also in the Bedfordshire Times and Independent of 18 June 1915, was a report of the Corn Exchange concert on Sunday, 13 June, at which Lance-Corporal Adams of the Middlesex Regiment, a vocalist with a wonderful soprano voice, met with a great reception for his glorious rendering of ‘The Holy City’, and Lance-Corporal Michael O’Leary of the Middlesex Regiment was in excellent voice in ‘The Star of Bethlehem’ which gained him an ovation. The paper also reported that on stage at the Empire that week, Miss Ray Wallace, who recently appeared in Bedford at a concert of the 2/10th Middlesex, delights the audience with her songs at the piano, and her mimicries of leading musical-hall artistes. Sunday evening concerts at the Corn Exchange were a regular feature of the entertainments programme for the troops stationed in Bedford. On 4 July 1915, there was a large audience, in spite of the fiery tempest without, reported the Bedfordshire Times and Independent of 9 July. Captain Kingzett, who had made such a successful debut the previous Sunday, again sang and received an ovation. He sang Liddell’s “Abide with me” and “Land of Hope and Glory,” the chorus of the latter being repeated and taken up with gusto by the audience and the 5th Welsh choir. As encores Captain Kingzett gave “I know a lovely garden” and “Because.” The 5th Welsh choir, under Private Williams, gave excellent renderings of the old Welsh air “The Ash Grove,” “Comrades in Arms” (for which they were encored)*, and “The Little Church,” in which was introduced a fine bell effect. At the organ, Dr Harding played some variations on the Russian National Anthem, and Mr H J Colson, “Postlude.” The hymns were “Fight the good fight,” and “Jesu, lover of my soul.” Mr Machin said that next week there would be concerts at the Empire, and the Royal County Theatre, as well as the Corn Exchange, and that there would be a visit of the Scottish contralto, Miss Helen Blain, who was a friend of Captain Kingzett and would sing duets with him. On the evening of 5 July 1915, a successful open-air concert was given in the Mill Meadows by members of the 1/1st Welsh Carnarvon, Royal Garrison Artillery. The program also included music by the Kempston Silver Band. Songs were given by Sergeant P J Jones, Gunner D W Hughes, Gunner John Lewis, Second-Lieutenant J Roberts, Second-Lieutenant R Parry Morris, Gunner R J Roberts, Gunner T Norman, Gunner R Stallard: Driver H Owen also contributed a song, and Gunners J and R Stallard gave a comic duet. There was a large audience. An appeal was made in The Carmarthen Weekly Reporter of 9 July 1915 by Mrs Bowen (mother of Major A Ll Bowen, 1/4th Welsh Regiment) on behalf of 250 Llanelly boys then at Bedford, and who were under orders for the Mediterranean, for Cholera belts. A letter from Mr William Machin, Secretary of the Bedford Recreation Committee, was published in the Bedfordshire Times and Independent of 30 July 1915 concerning a request for mosquito nets: ‘Three weeks ago there came a sudden call to the Recreation Committee for thousands of mosquito nets and other things for the use of soldiers who were about to leave us for the front; and we asked the churches at a few hours’ notice to supply us with 200 volunteer ladies who would be willing to sew, sew, sew, for a week or more. *”Stick it, Welsh” are said to be the dying words of Captain Mark Haggard, the nephew of the author Rider Haggard, and the circumstances are described in the Chronicle, in the page Arrivals at and departures from Bedford. The Welsh Fusiliers in one of the large empty houses in De Parys Avenue, on Wednesday afternoon, whiled away the time during the rain with some admirable part singing, reported the Bedfordshire Times and Independent of 3 September 1915. There are many worse ways of preventing time from hanging heavily on rainy afternoons, and few better. The paper also reported that the Band of the 6th Royal Welsh Fusiliers gave a concert in the Bedford Park Hut on Friday. 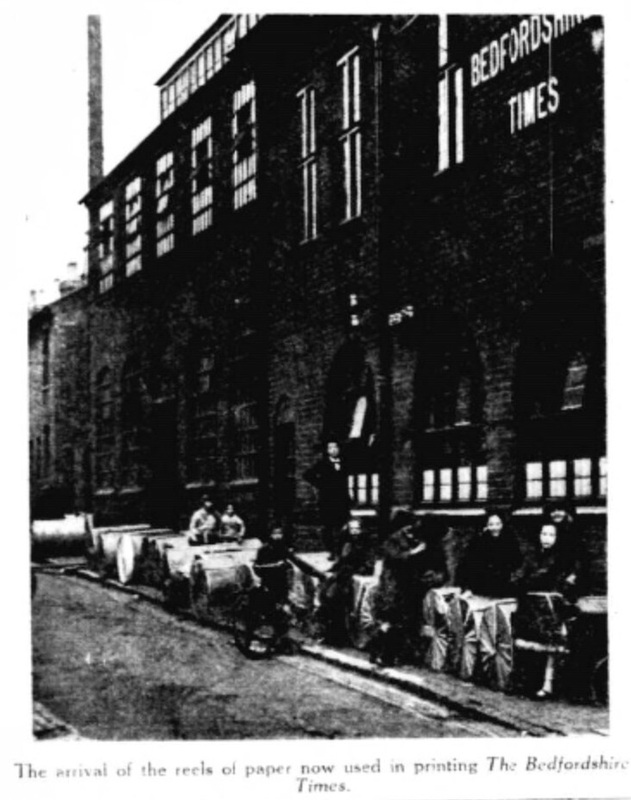 The Bedfordshire Times and Independent of 10 September 1915 included this picture of the men of D Company, 2/1st Herefordshire Regiment assembled for dinner at the newspaper’s printing works in Sidney Road. The Bangor Diocesan Tract Society made a grant of Welsh hymn books, booklets and tracts, to the value of seven guineas, to the Royal Welsh Fusiliers quartered at Bedford, reported the North Wales Chronicle and Advertiser for the Principality of 24 September 1915. On Monday, 18 October 1915, the Monmouths Regimental Band gave a concert in the grounds at Howbury Hall which, through the kindness of Mr Cecil Polhill, had been turned into a Red Cross Hospital and was in full working order. Mrs Deane, of Goldington Bury, was the Commandant and members of the VAD were working under the supervision of a Trained Sister. The Bedfordshire Times and Independent of 22 October 1915 reported forthcoming concerts on Sunday, 24 October at the Corn Exchange, which would ‘be real Welsh’, the Empire, where the band of the 2/3rd Monmouths would perform, and the Royal County Theatre, where two good vocalists, one from the Herefords and one from the Royal Engineers, would perform with the band of the 2/1st Herefords. In the evening Rev Jones attended the Welsh service in St Cuthbert’s Hall, where a good muster of Welshmen had come together to worship in their native tongue. The service was conducted by Chaplain Hughes (late of Carnarvon). The lessons were read by General Mainwaring in English and Colonel Jones Roberts (of Penygroes) in Welsh. A solo was rendered by Private Llewelyn Jones (Llew Colwyn) ‘The Sailor’s Grave’, and the accompanist was Bandsman Owen Evans of Dinorwic. 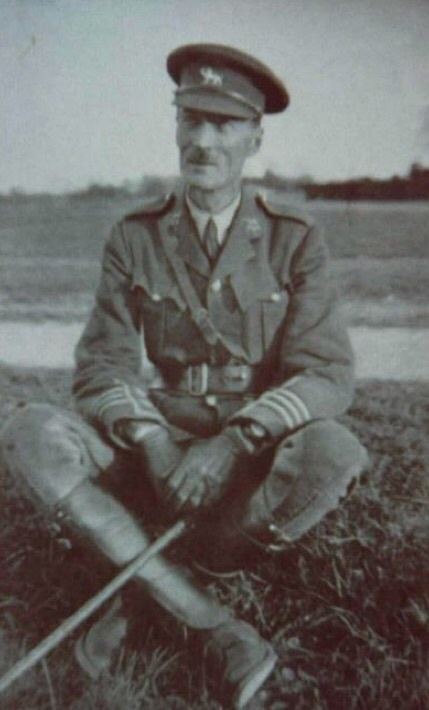 Colonel Jones Roberts was very popular with the men of the 6th Division, who were mostly Welshmen and he and Mrs Jones saw that they got every comfort possible. The Bedfordshire Times and Independent of Friday, 24 December 1915 reported that on Friday (17 December) a concert was held in the New Canteen and Recreation Room in Biddenham, near Bedford, which was formally opened by Colonel C J Markham, Commanding the 205th Infantry Brigade (the 2nd Welsh Border Brigade and part of the 68th (2nd Welsh) Division). ‘In introducing Colonel Markham, Major Carpenter, Organising Secretary, referred to the generosity of the Trustees of the Biddenham estate, and Mrs Wingfield in the provision and alteration of the building, and the liberality of the tenant, Mr J Evans, who had given up possession of the building without compensation. The Organising Committee consisted of Captain Addie, Mrs Addie, Mrs Carpenter, Mrs Whitworth, Mrs Randall, Mr Herring (Secretary), and Mr Ingram (cashier), and several ladies offered their services as helpers. Gifts in kind had been received from Mr Whitworth (a piano), Mrs Carpenter, Miss Collie, Mrs Markham, Miss Howard, Mrs Spencer, Miss Street, Mrs Randall, etc, while the Bedford Borough Recreation Committee, through Mr Machin, placed at the disposal of the Local Committee many essentials in the way of furniture. That former farm barn which became in 1915 a new canteen and recreation room for the troops of the Great War continued to be transformed thereafter to become eventually the Biddenham village hall villagers know and cherish today. The Bedfordshire Times and Independent of 3 March reported on a drawing-room meeting on Tuesday, 29 February at Holbrook, De Parys Avenue, to promote the work of the Bedford Soldiers’ Home in Bromham Road. 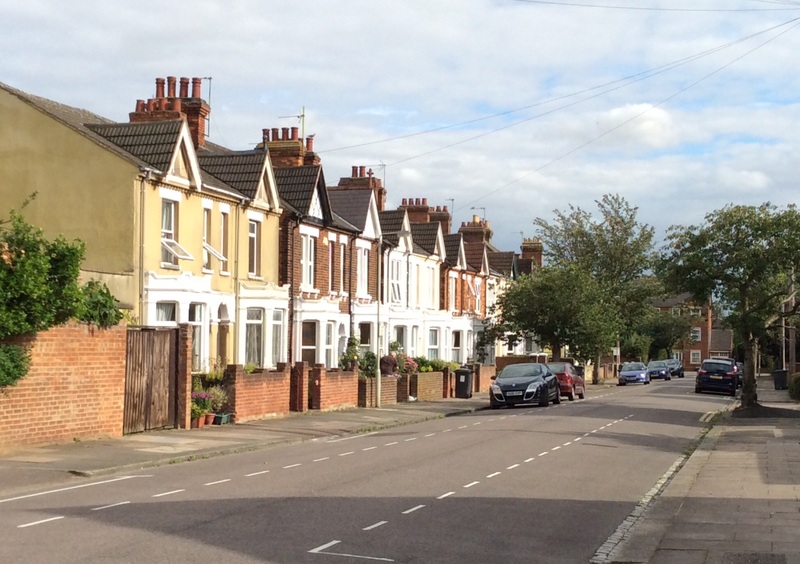 Bedford continued to its best, the paper said, both for the soldiers billeted in the town and for Bedfordshire soldiers serving overseas. Captain de Winton (Commander of D Company of the 2/1st Brecknockshire Battalion) chaired the meeting and told those attending how much his soldiers, mostly Welshmen, appreciated the Home. The Lady Superintendent, Miss Birney, described the work carried on there, where many men returned regularly. A short service – for which attendance was voluntary – was held there every night, which helped many young soldiers to lead better, purer lives. Many examples were given of the ways in which the Home benefited young soldiers and of how much it was appreciated. The Home was conducted in such a way that it provided the men with a real home away from home. 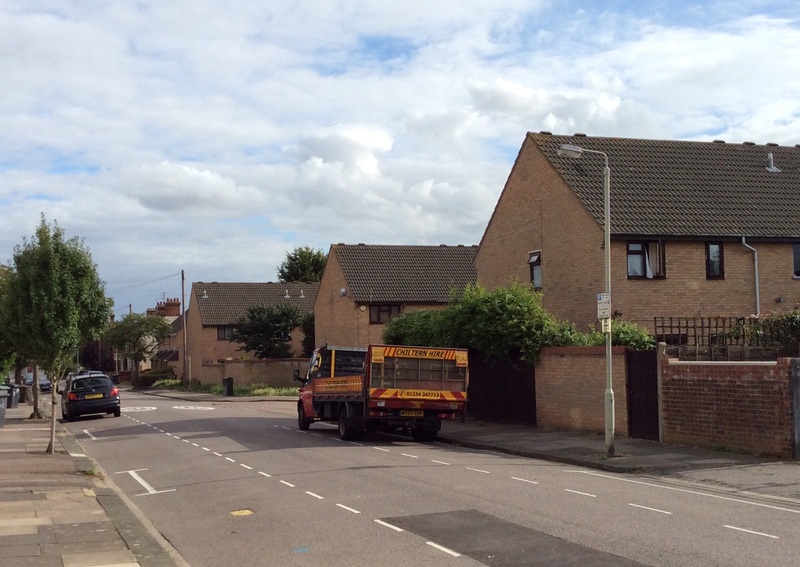 In response to the need for a second Home a house had been taken near the Barracks, but £200 would be needed by the end of March for the new Home to start its work. A collection was made which amounted to £22 13s, and a number of promises of help had already been received. He said that he had been asked in July 1915 to go to Bedford to minister to the troops of the 53rd Division (Welsh) of the Territorials, before they left for the Dardanelles. During that month three of the biggest chapels in the town of Bedford and district were practically filled with Nonconformists on the Sunday morning in church parade, two in Welsh and one in English. But, he added, he could produce evidence that a large number of those who attended our services on the Sunday were marked in the Army register as Church of England members, although they never attended the services of that Church in the town. The Bedfordshire Times and Independent of Friday, 9 June 1916 reported that at the Corn Exchange concert next Sunday evening, Dr Harding will give a rendering on the organ of Chopin’s Funeral March in memory of the late Lord Kitchener. The artistes will include Madame Gabrielle Harris (elocutionist), Private Ernest Butcher, 2/5th RWF, Private A Thomas, 2/5th RWF, and St Paul’s choir. A special concert for the officers, and men of the 68th Welsh Division by the Welsh Male Voice Choir of London, conducted by the celebrated musician, Dr Walford Davies, was held in the Corn Exchange on Saturday, 8 July 1916 at 7 o’clock. All seats were free to soldiers. The Choir had recently sung before the Royal Family at Buckingham Palace, by special command of King George V.
In July 1916 the Bedford Borough Recreation Committee for the Troops presented to Dr Harding and the choir of St Paul’s Church an illuminated letter of thanks for the two years during which they gave Sunday evening concerts at the Corn Exchange for the 1st Highland Division and the 53rd and 68th Welsh Divisions. A group of Welsh soldiers got together on the Embankment on Monday evening, said the Bedfordshire Times and Independent of 29 September 1916, and sang a number of delightful part songs and hymns to native tunes. They did it most tastefully and beautifully, and a small crowd which had gathered round gave the men a clap after each item. The Aberdare Leader of 27 January 1917 included a detailed contribution from Saddler T H Richards, of Mountain Ash, then with the 1/5th Welsh Transport in Egypt, writing about the 1/5th Welsh Choir which had won the championship of Egypt. He recounted the history of the choir, which had scored great successes in Scotland and Bedford, and had gone on to sing on Turkish soil, where after three weeks half of the original choir were missing, some killed and some wounded. After the evacuation from Gallipoli, a new choir was formed in the desert in Egypt, discovered other choirs and won in eisteddfods that were organised.